Our Sportscraft heavy duty steel swivel adapters will allow your front driver or passenger seat to swivel. These work with most Sprinter front seats, (will not work with suspension seats) and will work with the heated seat and seat air bag options. Swivels lock securely in the forward facing position. 2019 models may have an auxiliary battery under the passenger seat that may interfere with swivel. Our swivels have an exclusive offset center pivot point that allows the swivel to turn without opening the door. Swivels rotate on super strong nylon rollers that give the swivel smooth and quiet operation. Nylon rollers never wear out, and have a limited lifetime warranty*. Driver's side swivel includes adapter to allow hand brake to clear seat. Hand brake adapter is a bonus, as it allows a lower height swivel to clear parking brake. Raises seat height approx. 1.5"
Usually ships within 1-2 days of order date. Please allow an additional 1-5 business days for delivery to most US addresses. *Limited lifetime warranty against factory defects and on nylon rollers and center bearings to the original purchaser. This swivel seat adapter is awesome. Very easy to install. Took about 20 minutes and it was ready to go. Mainly, thanks to the supplementary instructions included along with the German instructions. Seat is comfortable and swivels really easy. Does cause seat to sit a little higher but that was expected. Purchased for a 2016 High Roof 144 WB. The holes for attaching to the base did not align properly. Had to use a Dremel like tool with an abrasive cone to enlarge 2 of the holes (~3 hrs work). Added some Rust-Oleum and finally could install. Moving the seat-belt attachment was easy, but not well mentioned in all instructional videos. After several days, the height gained on the seat is not obvious. Seat operation is easy, no need to open door, just move seat forward a bit. REPLY FROM EUROCAMPERS: If you follow the included instructions they mention to loosen the bolts that hold the seat base to the floor of the van. This will allow the seat base to easily flex and align with the holes in the swivel adapter. 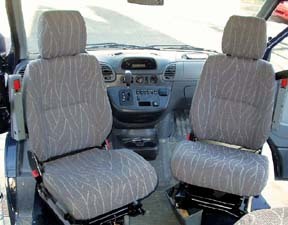 The seat base in the Sprinter is out of square and this procedure will match everything up. Old tooling at Mercedes? Sloppy work at the Mercedes Factory? It's not our swivels. Bought a set of these for my Sprinter Van. A bit tricky to swivel in - trying to avoid the door and the steering wheel, but it is a solid swivel and holds the chair well. Note that it does raise the seat up a bit - as disclosed by the mfr. Be sure to loosen all of the base bolts to make the bit of the metal screws easier. We are thrilled with them. They make the interior so much roomier and they are still comfortable!